I'm a big fan of lemon curd. It's sweet, it's tangy, it's yellow - I can't really think of any downside. 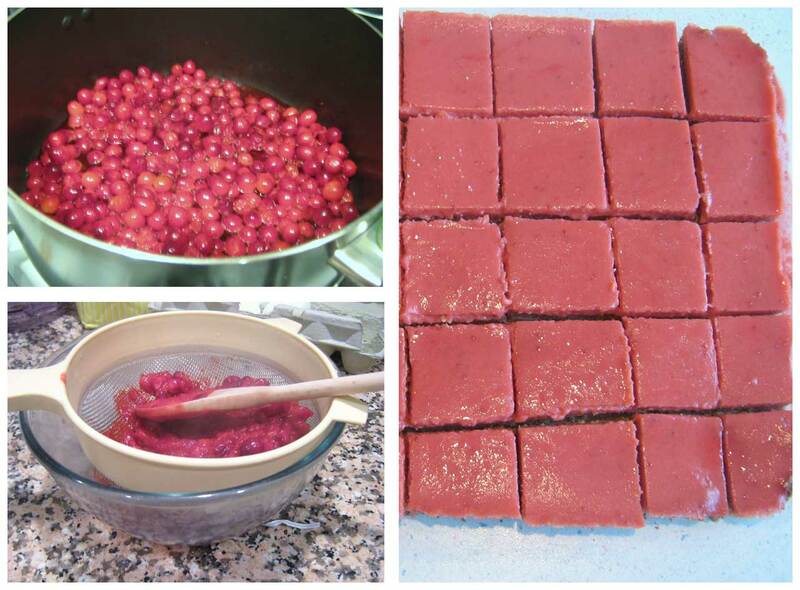 So when my little eye spied a recipe out in the world wide web for cranberry curd bars, I was hesitant. Fact is, I don't even really like cranberries too much. They're too...tart. But in curd form, I thought, they just might work. I was right. The cranberry curd was lip-smacking good. It was the crust I wasn't crazy about. But now I've discovered this brightly-hued filling, I have other things in mind for it. Especially since I can even make it with frozen cranberries. This recipe requires a little more effort and time than you may be used to - but I really found making the curd to be fun: cooking all the little cranberries until they pop and release their juice, then working them through the strainer until every last bit oozes through. You really want to spend some time working the berries through the sieve - a little elbow grease and you'll just have the skins remaining. And much stronger biceps. Tip of the Day: To test a curds done-ness, coat the back of a spoon in it, and draw a path with your finger. If the path remains distinct for at least a few seconds, your curd is done. Mix the ground nuts, flour, sugar, cinnamon and salt together in the bowl of a food processor. Dice the butter into pieces, and sprinkle on top. Pulse until the mixture holds together when you pinch it, 20 to 25 pulses. Press the crust into the bottom of a greased 9x13" pan. Freeze for 15 minutes. Bake the crust on 350 F for 20 to 25 minutes, until beginning to brown. While the crust is baking, place the cranberries and water in a medium-sized sauce pot over medium-high heat and stir. Cook and stir until all the cranberries have "popped" and become mushy, 5 to 10 minutes. Pour the mixture through a fine-meshed strainer, and press it through into the bowl. Make sure you "pop" any remaining berries and push everything through the sieve. Allow the puree to cool to room temperature. Discard the cranberry skins and clean the strainer for use in the next step. Add the sugar, eggs and yolks, lemon juice and salt to the cranberry puree and mix well. Return the cranberry mixture to the saucepan and set the burner to medium. Stir the curd continuously, making sure to scrape the bottom and corners of the pan. Cook until the curd starts to thicken and coats the back of a spoon. It should read about 150 F on a thermometer, after 10 to 12 minutes. Remove the pan from the heat and add the butter, diced into pieces. Stir until the butter has completely melted, then pour the curd through the strainer into a clean bowl. Pour the warm cranberry curd onto the crust. Bake at 350° for 10-15 minutes, Cool completely and refrigerate before cutting. I like cranberries AND I like lemon curd. *sigh* Dang new year and weight loss plans. LOL I'm adding this to my "must try" recipe list! Ah, I finally know what to do with that bag of frozen cranberries sitting in my freezer! I've always wanted to try making lemon curd, but these are definitely going to take priority over that. Thanks for the great inspiration!